What are some of the best vines for container gardens? They can be both trailing and climbing plants. 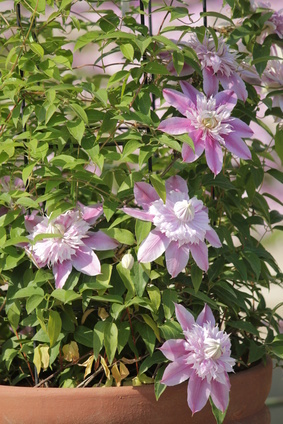 Use trailers and climbers as stand alone plants, or use them as a backdrop for other containers of flowers and foliage. Trellis grown plants are useful when designing your outdoor living areas. 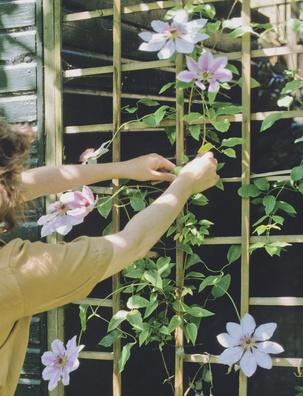 Plant vines in containers and train them to climb a nearby trellis or other structure. Or, put the support right in the container. Either way will work. An inexpensive support is a wire tomato cage. Use the largest container that you can since vines dry out quickly and will need lots of soil and water. You don’t want them to blow over in the wind either. If you prefer to plant vines that spill over the edges of your container gardens, plant them to the front or sides of the pot or basket. Vines are heavy feeders, so make sure you use a water soluble fertilizer every two weeks or so when you water. Try pairing Virginia creeper and maypop, jasmine and canary creeper, or golden hops and morning glory (shown right) in containers. They complement one another and make dramatic combinations. 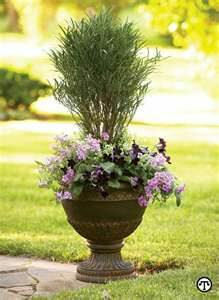 Trailing plants are an important part of container garden design. They soften the edges of the container and provide the finishing touch. 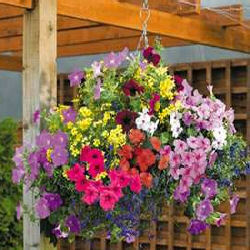 Plants that trail or vine are also the staples of hanging baskets. Petunias, geraniums, verbena, begonias, fuchsia or all kinds of ivy are some of my favorites. Here are some wonderful trailing vines for container gardens. You may already love some of them, but hopefully you’ll find something new to try here too. Climbing vines for container gardens can provide height or structure to your design. Anchor a trellis or other vertical support in the pot itself, or place the container with the plant in front or to the side of the trellis. Add mounding plants around the climber, and perhaps a trailing plant as well – you now have the perfect container garden design. Use climbers in containers to break up the blankness of a fence or wall, or to help hide eyesores – air conditioning units, compost piles, etc. They can also be used as landscape devices, creating buffers, transitioning areas, creating a wall or providing privacy – much like shrubs or trees can be used. tall backdrop from which to feature mounding or trailing plants in front. For other vines for container gardens, visit garden.org. You can search for plants in your own growing region. Search by plant type “vine” and then narrow your search by “good for containers”, color, bloom time, etc. You will get a personalized list of recommendations that should grow well in your area. The National Gardening Association is a great resource.